Always looked back upon as a grand era in time, the 1950’s brought about a great and interesting movement in automobiles. We wanted to go faster, and we wanted to build something unique and cool. This 1951 Ford custom roadster is most certainly a one of a kind. 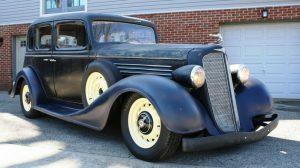 Primarily based off of an English Ford, with some Studebaker parts, and other various parts thrown in the mix, this is certainly an interesting and eye catching machine. Currently up for bid and at no reserve, we ponder what this custom Ford may sell for. Find it here on eBay out of Upland, California. 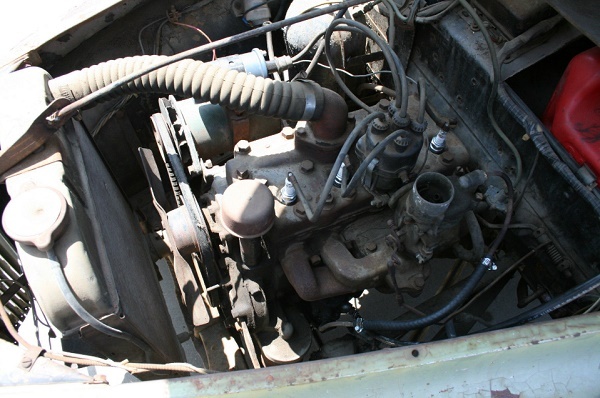 The heart of this English Ford is an 1172cc 4 cylinder side valve engine backed by a 3 speed transmission. Appearing mostly stock in the engine bay with a fine layer of dirt, this little engine does indeed run and drive. The air cleaner appears to be missing in action, and it would appear there is a small gallon fuel canister tucked in the bay currently fueling the car. 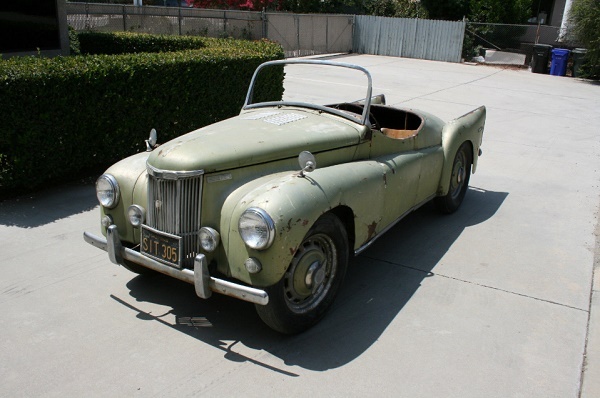 The seller has mentioned the original fuel tank, and water pump need repair. Both items not being too big of a hassle to deal with. We are excited to see that this one still runs and is in such original shape from the great visionary’s mind who built this interesting ford. The styling on this custom roadster is certainly interesting. 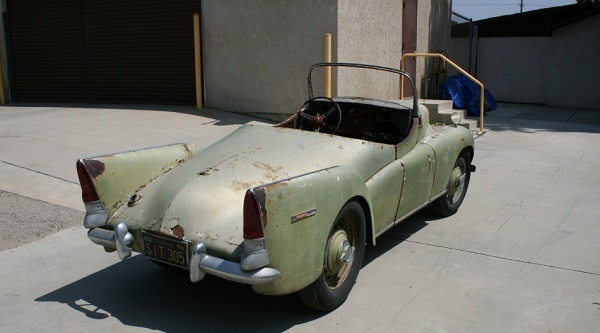 The fins are listed as being Studebaker, and the trunk section of the car is actually a Studebaker hood. 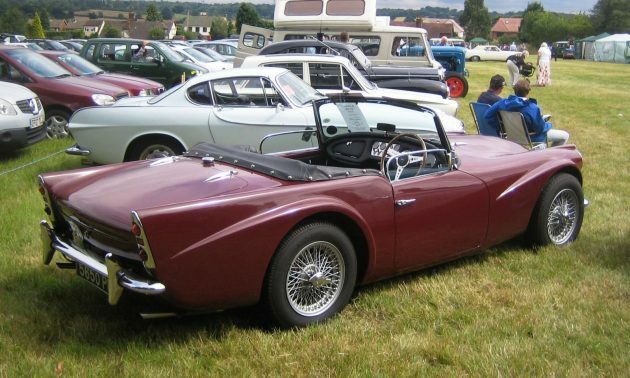 The body line from the front fenders slopping back is reminiscent of a Triumph Tr3. Knock off style hub caps and the light shade of green draw in the entire package of this car, flaunting its interesting lines and style. The interior is simple, yet glorious. The Bucket seats are listed as custom made fiberglass units, and it would appear this Ford recently got some fresh flooring. 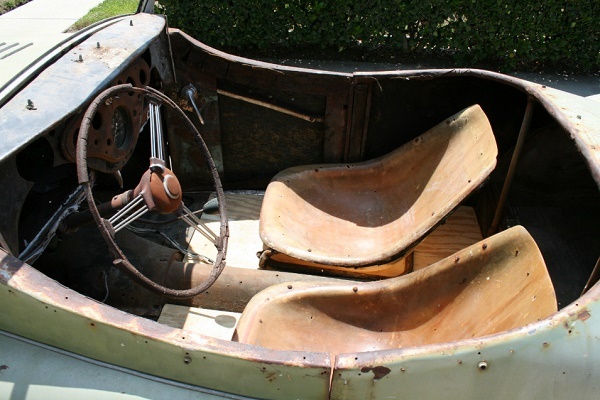 The steering wheel is a little dry and dated as well the rest of the interior. But there is enough to leave the interior as is, or to freshen it up. 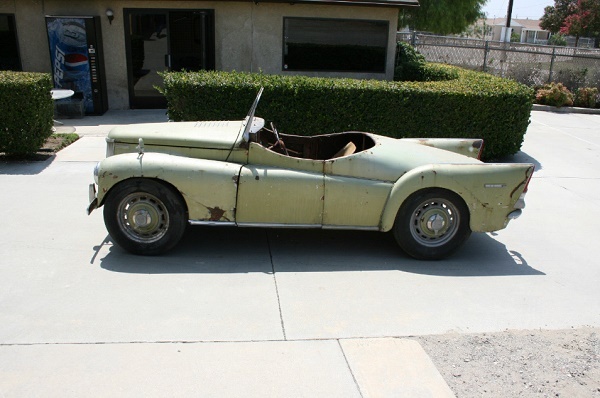 This is really a very cool car to have survived as well as it has. But what should be its fate? 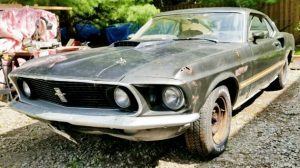 Should it be restored? Should it be preserved and enjoyed? From what we can see, we think it would be a fantastic preservation car, as it wear much of its green paint, and shows so much interesting history, and creativity. It’s fascinating to study the lines on this one, and see what the builder did here and there to create this Ford custom. So what would you do with this Custom Ford? Restore it, or preserve it? 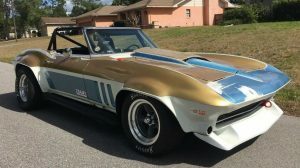 How very cool it would be to see this wonderful automobile sitting in a museum, or, at a car show, or, in a parade completely restored. it is amazing what one can come up with from a thought a Hmmmm, I wonder, a dream, what if I did…??? Have to ask, does it have a title and data plate? This would certainly be museum worthy, to the right museum. Many museums focus on fully restored, or very nice survivors. Although as of the last 6 years or so, it seems not that uncommon to find a car in a museum that has some patina on it. 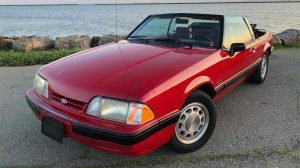 We would love to see this Ford preserved, and available to the public to see. Like you said Paul, it is amazing what some people can create. Love it. Most of these look like a hodgepodge of unrelated parts, this is pretty cohesive. The interior needs a bit more. I’m thinking a single wraparound seat with tuck and roll, probably in red, with a black exterior. From that angle, it does have a little SP250 in its looks. MUCH better pictures this time! Ugly in June, ugly now. I like the overall execution, with the exception of the seats. pretty cool looking hand built roadster. needs a flat head V8 IMO. Custom seats? They look like off the shelf 60s dune buggy seats. Probably with the backs cut down to make them lower. And if you look at our earlier posting, the car had seating back in June that looked much more in keeping with the style. This one’s been bouncin’ around for a while – and proves my axiom – good taste and good fabrication skills don’t always run hand in hand! Nevertheless, if it was reasonable enough, I’d like to own it! Not quite my ‘cup of tea’, but interesting. I echo the comments on the interior – it definitely needs something. I’m surprised no-one has mentioned the windshield frame. It looks all wrong at that height and angle. Chop 8 inches off it and rake it back 10-15 degrees and it would flow much better with the ‘aerodynamic’ lines that the builder seemed to be aiming for. I applaud the builder’s execution skills, if not his styling skills. What Jamie said…..and it looks like they’ve fixed the 56 Stude taillights……this is a custom built car not a factory job. steering wheel is a little dry!? Why do you continue to call a flat head or L head engine a side valve which it is not. A side valve engine has the valves perpendicular to the cylinder not parallel like a flat head. This is a flat head engine or the proper term L head, not a side valve. I have only seen side valve engines in is old Minneapolis Moline tractor engines. Norman – I don’t think you know what you’re talking about, you’re at least not familiar with how most people refer to engine designs. In England a flat head is the same as a side valve because – uh, the valves are to the side! Americans have often referred to flat heads as “L” heads. Invert an “L” and look at it – you’ll see why. For more useless trivia, all my six cylinder Bentley and Rolls-Royce cars have an “F” head engine – so named because the exhaust valve is in the block like an “L” or flat head whereas the intake valve is overhead. The “F” designation should be obvious . . . although it’s also been suggested that the “F” was used as a means of being polite and not using the entire word one is tempted to use when having to adjust the exhaust valve tappets – a thoroughly complicated and frustrating operation for those of us with normal sized hands and fingers!